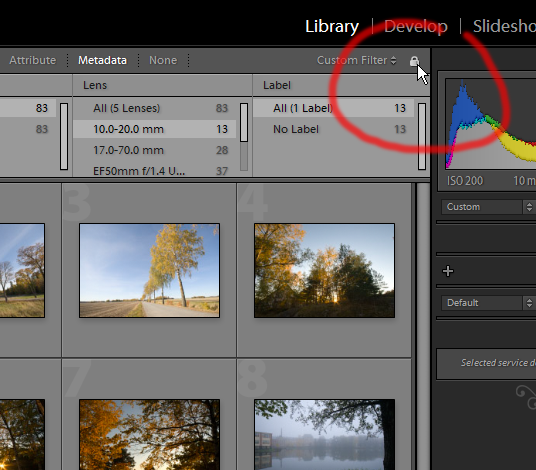 Edit: Want to read about the new Lightroom 3 beta 2? Now, many know-it-all photographers complain about other photographers pixel-peeping. Looking at your photos at 1:1 or 100% is the worst thing you can do, according to these people! Since photos are made up of pixels, there is no other way of checking image quality than looking at the pixels – peep away! And that’s what we’re going to do here. Otherwise we wouldn’t see any differences at all. 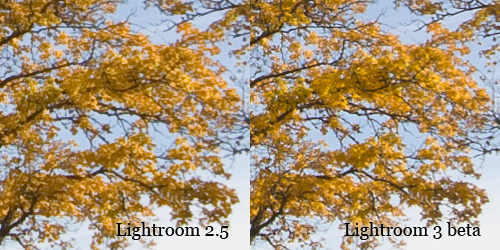 So basically all the anti-peepers need not worry about Lightroom 3 beta. If you pull the sharpness slider down to 0 though, the difference between the two versions is pretty much nil. So I draw the conclusion that the sharpness algorithms have changed more than the underlying de-mosaicing algorithms. 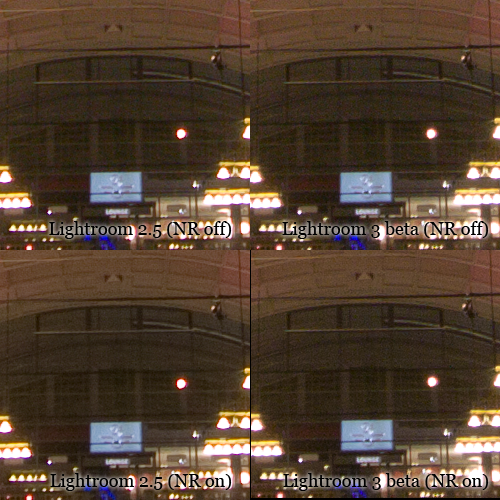 NR on in the comparison above means colour noise reduction set to 10. Sharpness settings were now at Lightroom defaults, 25 – 1.0 – 25. Of course, they haven’t yet implemented luminance noise reduction, let’s see what they can do there. In Lightroom 2 I never use the luminance slider because it just takes away so much detail. I imported (added to a new catalogue) two folders containing a total of 295 photos from my Canon EOS 30D. I chose to render 1:1 previews at the same time. This took just over six minutes in Lightroom 2, but almost three times as long in Lightroom 3 beta! The actual import though (minus the 1:1 rendering) took roughly half as long in 3 beta as in 2. I kept an eye on CPU usage while doing this. 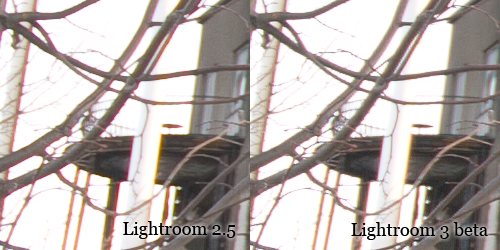 There isn’t much difference, but Lightroom 3 beta seems to be slightly worse than v2 at using all the power in our quad core AMD Phenom II CPU. I also tried exporting 82 photos to full-size JPEGs. This took 95% longer in 3 beta, even though it was using roughly 80% of the CPU compared to around 63% for v2. I read somewhere that you don’t get the blurry thumbnails in 3 beta that you got in v1 and v2. That’s not entirely true. You maybe won’t see them as often because scrolling is slower (see below) but you can definitely still get to see blurry thumbnails. I’m not sure there’s been any real improvement when it comes to leafing through photos in loupe view either. There can still be a delay before you see the photo nice and sharp, depending on how much time you allow for the next image to pre-load. The scrolling in the Library was changed from Lightroom 1 to 2, for the better. It was made much faster. Now it has been made worse again. Adobe have implemented scroll acceleration, so you need to scroll fast to get anywhere. I liked the old way, in 2, where you could scroll a notch or two and still get somewhere. This new implementation is much more hard work for my index finger. 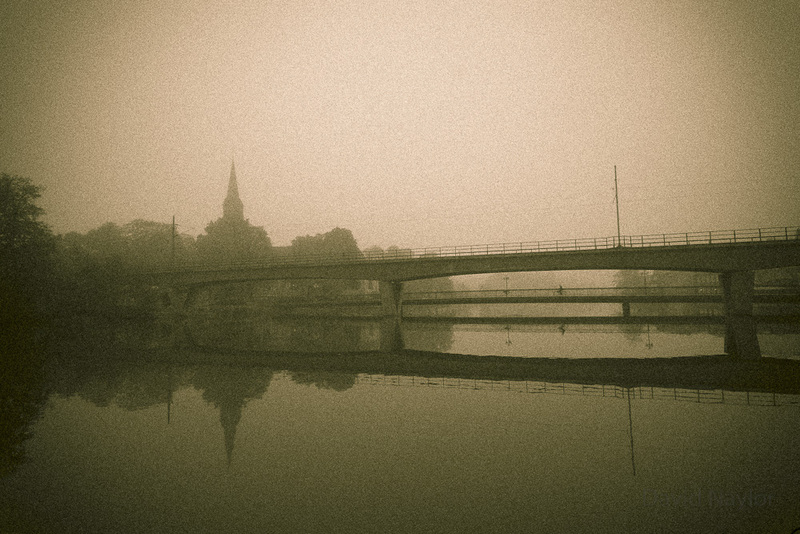 Here the grain is combined with a split toning, which is possible in version 2 as well. In Lightroom 2, any filter you make in the Library will remain active in the folder or collection where you created it even when you moved to another folder and back. But it wouldn’t remain active from one folder to another. 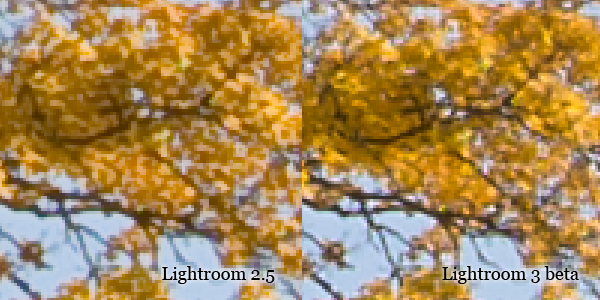 This is done much more intuitively in Lightroom 3 beta, if you ask me. Now, by default, the filter will be forgotten if you switch from one folder to another. But you can choose to lock it with a padlock icon, and it will remain active for any folder or collection you browse to. There are still a few things on my feature wish-list for Lightroom 3 final. Quite a lot of nice improvements! Some may seem insignificant to others while making a huge difference for me. The best part is that the Lightroom developers are still hard at work, so I’m keeping my fingers crossed for the two things above! Posted at 17:06. Tags: review. Categories: Lightroom, photography. Both comments and trackbacks are closed.